Designs By JuJu is one of the leading machine embroidery downloads websites. 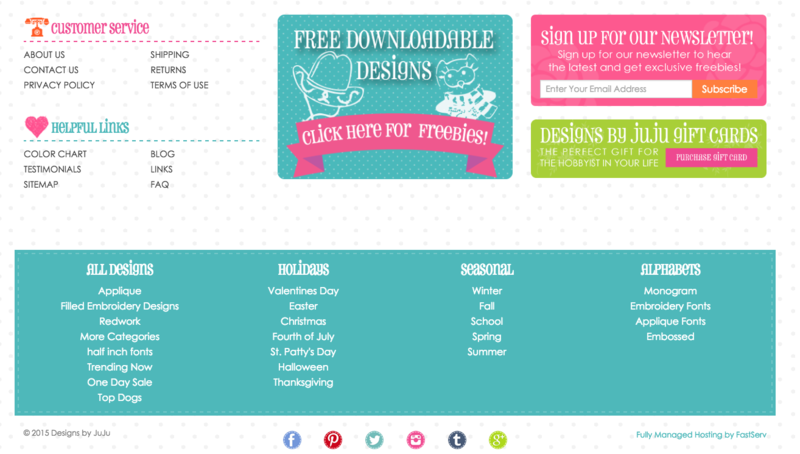 With a large portfolio of designs to choose from such as holiday designs, children's designs, fonts, and much more, there is always something for everyone. Designs By JuJu releases new designs every week so that you can find something unique at all times. Designs By JuJu had a very complex set of requirements because of the digital downloads nature of their website. They needed to ensure that customers could not buy something they had already purchased and there were no issues with downloading and using products over and over again. They also had an older user base and needed a modern site that could still appeal to older users. "Trellis has done an outstanding job developing a complex, interactive eCommerce digital downloads website for my company that involved extensive programming and customized features. They went above and beyond, working many long hours to get my website launched and were there for me to make sure all was going smoothly, and iron out the bugs that occur with any new complex project like this. I am so impressed with how professional and responsive they have been to my needs, taking my phone calls, prompt replies to my (numerous emails) and their overall kind and friendly nature. Everyone at Trellis worked with me to create a website with exactly the features I wanted and needed. I'm thrilled with my new store and look forward to a long working relationship with this fabulous company!" - Julie Hesketh, Owner of Designs By JuJu.